Lawsuit against police violence at Republican National Convention to go forward | Fight Back! Minneapolis, MN – At a March 4 press conference outside the Federal Building, lawyers who filed the first lawsuit resulting from police violence at the 2008 Republican National Convention announced their plan to move forward with litigation in the case of Mick Kelly. In a widely publicized incident, police, standing only feet away, shot Kelly in his stomach with a high velocity marking projectile at the demonstration organized by the Anti-War Committee on the fourth day of the RNC, September 4, 2008. Mick Kelly, one of the main organizers of the massive march and rally on the first day of the Republican National Convention, earlier prevailed in a separate lawsuit against the city of St. Paul after his arrest for leafleting at a June 2008 Obama rally. 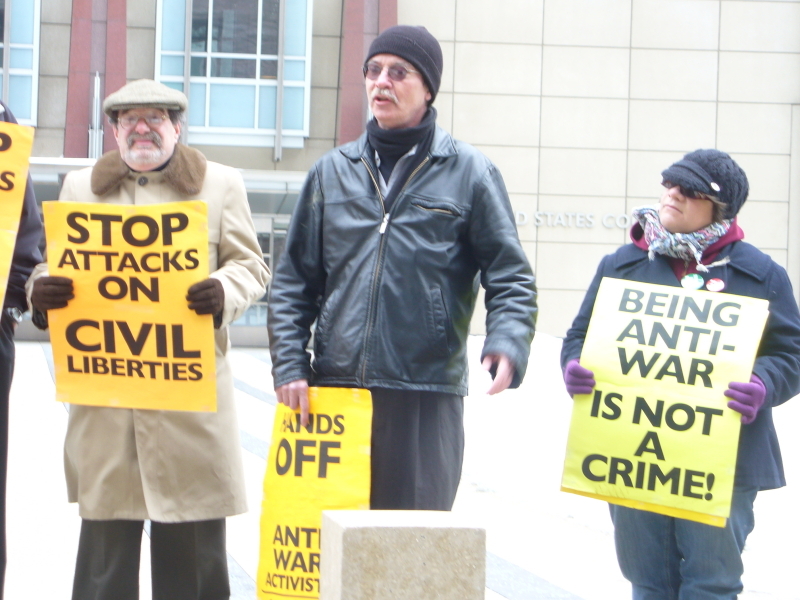 He is also one of the Twin Cities anti-war and international solidarity activists whose home was raided by the FBI on September 24, 2010. Law enforcement agencies failed to reveal the presence of an undercover infiltrator during the discovery process of Kelly’s 2008 RNC lawsuit. The existence of an undercover law enforcement officer who was active for two years in RNC protest organizations was first revealed in the course of communications between lawyers representing activists whose homes were raided by the FBI September 24, 2010 and Chicago Assistant U.S. Attorney Brandon Fox. The infiltrator, who went by the name “Karen Sullivan,” remained active in the Twin Cites peace movement until the September 24 raids, when she vanished. The lawsuit is being pursued by attorneys Ted Dooley and Peter Nickitas, members of the National Lawyers Guild. Ted Dooley was one of the speakers at the press conference.